The fastest remedial wall tie system in the world is now widely available from Twistfix. The patented wall ties take an average of just 10 seconds to drive through medium strength brickwork. Using two operatives for drilling and one for installing the ties it is not unusual for a team of three to install 1,000 ties per day says product inventor Mr Henry Ollis. The self-tapping stainless helical tie system utilises a tiny 6mm pilot hole. This limits brick damage when the drill bit breaks through into the cavity, thereby reducing the risk of cavity blockage. The cavity wall ties are installed using a neat low-cost adapter fitted to a SDS drill. The ties are simply hammer-driven into the pilot holes. The work hardened helix cuts twin threads into the masonry as installation proceeds. The result delivers a reliable mechanical connection that does not rely on expansive stress or on chemical adhesives. The ties simply grip bricks, blocks or concrete within the interlocking helical undercut. Twistfix remedial ties are widley specified around the globe from Scandinavia to Australia and from the United States to Eastern Europe. The ties have recently been tested in a variety of brick types by the a European Technical Approval testing house and have been granted European CE Mark Approval. No great skill is required to install the ties though one should always be careful when drilling the walls. 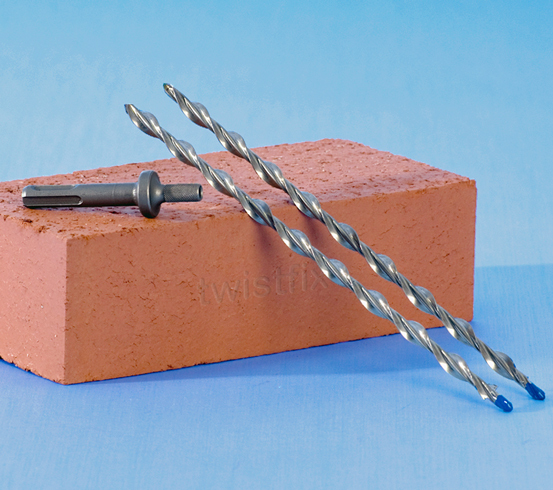 For extra value look out Twistfix remedial wall ties in a kit. Sufficient ties for 60m2 of brickwork at 2.5 ties per square meter, two long series SDS drill bits and the Twistfix wall tie adapeter. For more information about this particular product then take a look at our PDF datasheet or contact us on 0800 1236007, email info@twistfix.co.uk.